Hemel Hempstead Town missed the chance to gain ground on their Conference South playoff rivals as they were pegged back late on by struggling Maidenhead United at Vauxhall Road. Oliver Hawkins put the Tudors in front shortly before half-time, but Maidenhead hit back with just a few minutes left to play as Stefan Brown scrambled the ball home from a corner. 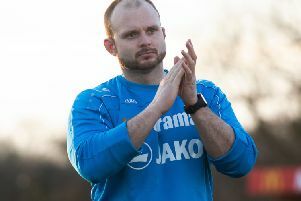 It was a big blow for Hemel, who could have made significant ground in the playoff race as promotion rivals Concord Rangers were beaten at Eastbourne, while Gosport Borough drew at home with Weston Super Mare. Maidenhead can, in fact, consider themselves unlucky not to have left Vauxhall Road with all three points after a strangely subdued performance from the home side. The Magpies had by far the majority of the possession and chances, with Hemel keeper Laurie Walker bringing off a string of saves, especially in the first period, to keep his side in the game. Danny Green was twice thwarted by Walker and Dave Tarpey also had an effort saved. After spending most of the half on the back foot, Hemel’s first effort on target saw them take the lead when James Potton curled in an excellent cross for Hawkins to superbly rise and head home on 41 minutes. Moments later Hawkins could have doubled the lead when his attempted chip was well saved by Ashley Timms in the visitors’ goal. Maidenhead trudged off at half time, not quite believing how they could be in a goal down after their efforts in the first 45 minutes. The Tudors improved slightly in the second half but it was still Maidenhead, who were belying their lowly league position, who looked more likely to score. Another corner caused problems for the Tudors when Walker could only punch the ball straight into the air, but as the ball fell towards the goal a defender managed to head clear. Hemel were relying on counter-attacks and Hawkins missed a good chance to relieve the pressure when he ran on to Potton’s pass but blazed the ball over the bar. Maidenhead forced a series of corners that saw Green and Tarpey both have shots blocked, and on another Tudors counter attack, sub Billy Gibson made a great run down the left before crossing to the on-rushing Kyle Connolly who met the ball on the volley but he couldn’t repeat his Chelmsford heroics as the effort flew wide. Justice was finally done in the 85th minute when sub Brown forced the ball home from close range to give The Magpies a deserved equaliser, after another period of pressure. Hemel could still have snatched all three points at the death, when Zane Banton raced clear, but his shot was saved by Timms and the referee blew for full-time moments later. He emphasised that this is what you get with a young team who he couldn’t fault for effort, but just couldn’t get their game going. Hemel - 1 Walker 2: King ( 16: Lee) 3: Connolly 4: Parkes 5: Hyam 6: Oshodi 7: Simmonds (14: Banton) 8: Harriott 9: Hawkins 10: Allen (15 : Gibson) 11: Potton. Subs not used - 12: Oli 22 Head. Maidenhead - 1:Timms 2: Soloman 3: Pritchard 4: Hunt 5:Vanderhyde (15 : Hippolyte) 6: Downer 7: Green 8:Clifton © (17 ; Barratt) 9: Erskine (12: Brown) 10: Miller-Rooney 11: Tarpey. Subs not used - 14: Upward 18: Morris. Man of the Match - Laurie Walker (Hemel). Hemel sit four points adrift of the playoff places, with just four games of the season left to play. Next up for Hemel is a potentially season-defining clash with Concord on Monday afternoon.